Silence those groans–the puns are part of the fun. 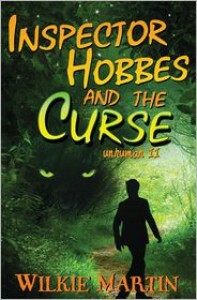 Inspector Hobbes and the Curse is the second book in a series about British Police Inspector Hobbes and his sidekick, the penniless, ex-journalist Andy. This book stands alone, enjoyable despite not reading the first. It’s a Holmesian spoof, with a hapless, feckless version of Watson, and a supernatural twist. Told from Andy’s point of view, it follows the attempts of the two to investigate a string of mysterious incidents in the area, beginning with night sightings of a giant feline. First stop–the local Wildlife Park, where we learn about Hobbes’ camel allergy and Andy literally falls at the feet of a gorgeous woman. Subsequent inquires take them to the local pub, various farmers, on a night surveillance or two and even to a local music festival. Matters become more serious when a man dies at Andy’s feet. Characterization is well done, if somewhat troublesome for me. Hobbes is classic Holmes, only a little more feral. Still arrogant, with mental and physical capabilities to match. Side characters generally get enough attention to come into their own, including Mrs. Goodfellow the housekeeper, Dregs the dog and Featherlight Binks, local bar owner and frequent brawler. Andy, however, was often my sticking point. He fulfills most of the tropes of the feckless sidekick: leaping to erroneous conclusions, cowardly, foolish, and repeatedly making one bad decision after another. In fact, he’s pretty much the Gilligan of the book. Amusing at times, but hard to root for as he hares off on one wild tangent after another. It’s clear he’s not the smartest of narrators from the start, when he’s taken to making dinner for himself and Hobbes because the housekeeper is out of town: “Certainly, he ate his [salad] without fuss, seeming not to mind the big green caterpillar on the lettuce, and he even complimented me on its freshness. He did, however, point out that the potatoes in a potato salad are better when cooked.” At times, the foolishness was extreme enough to be slapstick, so take tolerance for silliness into account when reading. That said, I enjoyed using Andy’s observations to try and interpret characters and situations for myself, a process that was complicated by Andy’s frank admittance that in Hobbes’ company, he had been encountered supernatural creatures. A few notes about the writing: Martin may well be trying to channel Sir Arthur, but initially I found the writing style hard to follow. Perhaps it was my own recent reading of Eats Shoots and Leaves, but I think Ms. Truss ought to have no fear that semicolons and colons are going out of fashion. Or, at least, Martin’s doing his best to bring them back. Phrasing is occasionally awkward: “Fortunately, for my well-being, the ten-mile journey could only have lasted five minutes, since the more I got used to his driving, the more frightening it became.” Luckily, once into the story, those instances could be ignored as I focused on the plotting and the humor. It is also written with a number of British slang words, so I finally got a bit of practice with the Kindle dictionary link. “Dozy,” “conker,” “doddle,” “punters,” and “pong” all got a look-up. Overall, it was an interesting mix of British detective comedy with shades of urban fantasy/supernatural mystery. I'd certainly check out others in the series. It made for a pleasant way to spend the afternoon.